What’s new in the Dubai Miracle Garden? Guests travelling to Dubai can rejoice as the Miracle Garden is in bloom once again! Dubai’s floral extravaganza is back for its seventh edition with a whole new list of promising attractions to keep things entertaining for visitors from across the globe. So, here’s a little sneak peek into all the new stuff at Dubai Miracle Garden this year. Right from the gate, guests can spot the makeover of the garden as a brand new set of giant feline structures welcome them in! There are also two new lakes, a grinning turtle with a full-blown garden on its back and a fully fitted amphitheater. At the newly launched Lost Paradise section, look out for the three life-sized, jolly-looking elephants spouting water from their trunks. 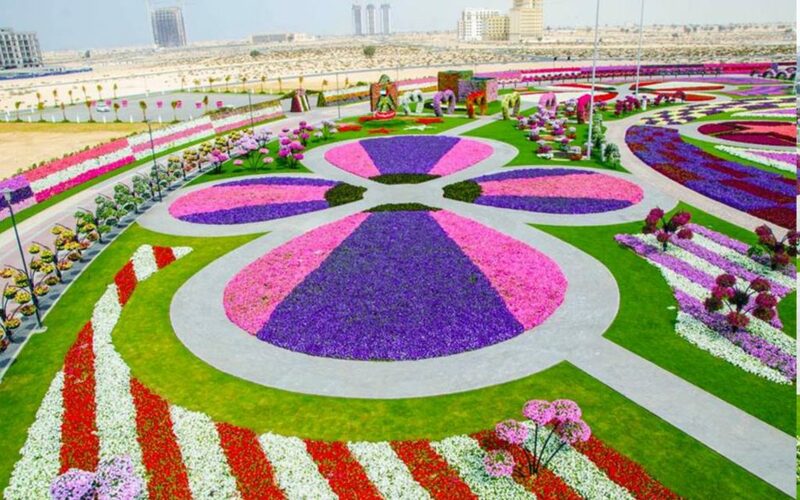 Earlier this year, Dubai Miracle Garden, unveiled an 18-m tall floral recreation of Mickey Mouse to mark the 90th anniversary of what is arguably Disney’s most famous creation. In true Dubai fashion, the floral tribute has become yet another attraction to enter the Guinness Book of World Records as the World’s Tallest Supported Topiary Sculpture. But that’s not the only exciting thing for Disney fans headed to Dubai; Mickey is joined by some of the other lovable characters from the House of Mouse. Accompanying Mickey, are the floral avatars of Minnie Mouse, Donald Duck, Daisy Duck, Goofy, Pluto and the naughty trio of Huey, Dewey and Louie at the newly opened Disney avenue section of the park. But that’s not all that is new! To grab a bite to eat after exploring the garden, visitors can pop by the Floral Castle for a garden dining experience. If they are feeling a little weary from all the walking, they can rest at the Caribbean and Asian hammocks located near the hanging gardens. Parents with kids will be happy to know that there’s an interactive children’s play zone with enough things to capture the imagination of little ones, along with a trampoline and other exciting activities to keep your little tykes entertained. Make the most of what the garden has to offer this year and plan a trip to take advantage of the gorgeous weather! The Dubai Miracle Garden is open from 9 am to 9 pm on weekdays and 9 am to 11 pm during weekends. Stay tuned to the best DMC in Dubai for more interesting news and updates!